I think the answer is senior year of high school, 2004. Sure there have been 4 day Spring Break trips here and there in college, as well as countless long weekends and of course visits home (home involves a beach) but an actual vacation involving a resort or a cruise or a passport... yeah, I got nothin. I think when bills and number of dogs grow, vacations dwindle! I wish this post was a post announcing a vacation I have coming up, but as I'm sure you gathered from this title, I will not be vacationing anywhere this year. Money is an object to me, vacation time is limited to just two weeks a year (only one last year since I was new to my position), I have two dogs that cost as much to board as a hotel room at the La Quinta and I just don't see a vacation being a possibility nor a priority for me. Plus, I like to milk my vacation days for all they are worth. For example, I like to plan my vacation days one at a time, tacking them on to an already long holiday weekend, just like I'll be doing this weekend! We have Good Friday off, so even though I'll be off 6 straight days from work, I'll only be using 3 days of vacation. Remember that one time I said to take something off before you leave? Yeah, everything I've already said could probably be erased from this post... ah well! Already typed it. So my Mom will be coming in town today at 3pm.... Vacation for her, Staycation for me! So why not check some stuff off of my Dallas Bucket List while we're at it, right? I'm going to make a new tab on my sidebar just for this bucket list, so I can check things off as I go. where the hell is corner bar on there? jk. we know what category should be on there. VERY good list, and i love the skyline pic, NICE! There are so many reasons I want to come to Texas but as cheesy as this is, I really want to come to the state fair... I don't know why, I just want to! We have fairs up here but I'm sure that one is eight million times the size of ours. Anyways, never been to Texas, already have a big Texas bucket list, and pretty much just added your whole list to mine... soo, I'm gonna need about a month there. Enjoy your staycation... I think it's fun to explore new things in your area! Honey.... If you have never been to the great state fair of Texas.... you haven't lived!!!! The food, the rides, the fun...... the people watching!!!! I have been every year since I was a little kid..... and I am knockin' on 60's door now!!! I think staycations can be even more relaxing than vacations sometimes. I hope you have a great time!!! Looks like you have a ton of fun things from your bucket list to choose from! oh, you've got to do TopGolf... stat. It's amazing!! And the arboretum is phenomenal! And the 6th floor museum. Those would be my top three from your list! The Ginger Man is the bomb!! I love that place! Staycations are great - so enjoy girl! That sounds awesome! I hope you're able to check some, if not all, of those off. Have fun! Let us know what the food is like! Enjoy time with your mom!! Anything specific on the list you are already have planned?? Aw darn! I was in Dallas last weekend!! I did manage to get to the farmers market! Yay, I hope you have an absolutely amazing long weekend!! I can't wait to hear all about your staycation! I'll be pinning this to come back to when I move. I've heard of The Quarter Bar and can't wait to try all of their New Orleans inspired drinks! If you go, have a hurricane for me! You can feed giraffes at the Dallas Zoo?!?! That alone is enough reason for me to go to Dallas! I don't remember the last time I was on vacation either. Does study abroad count? There will be no vacations for me until my loans are paid off. Money is definitely an object to be as well. And such a nuisance. I love Dallas though. I have family there that I'd love to go visit soon. Angel's family lives outside of Dallas so we end up going there every once in a while! I think it's definitely worth it to take some time to explore the place where you live! Have a great staycation! Sounds like you have some fun stuff planned to keep yourself busy! I dont know Dallas but staycations are always good! The Sixth Floor museum is pretty cool. I did that last time I was in Dallas. I'm going to be there next week. I can't wait to see what bucket list stuff my friends have in store for me! I can think of like 5 more things to add to that list and a gazillion more places to eat... and then you need to come to Fort Worth.... have fun with your mom! 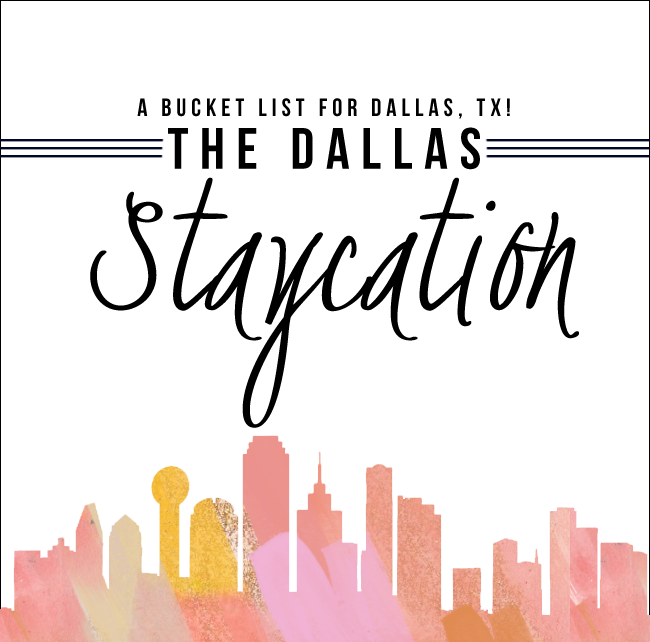 K & I will definitely use this bucket list when we take a sister trip to Dallas someday! I'm the same way with my vacation days - I feel stressed taking off too much time since there is so much to come back to! Instead, I just take off a random day just to relax and/or have a long weekend away. Looks like I need to come to the Big D and help you knock out your list! Mani & Martini? Let me know if you guys want to go to the Perot Museum. I can give you guys two free tickets for a day, I have a membership and can email you the tickets. Would you believe I've never had a real vacation? My first one will be next April and I'm beyond excited. 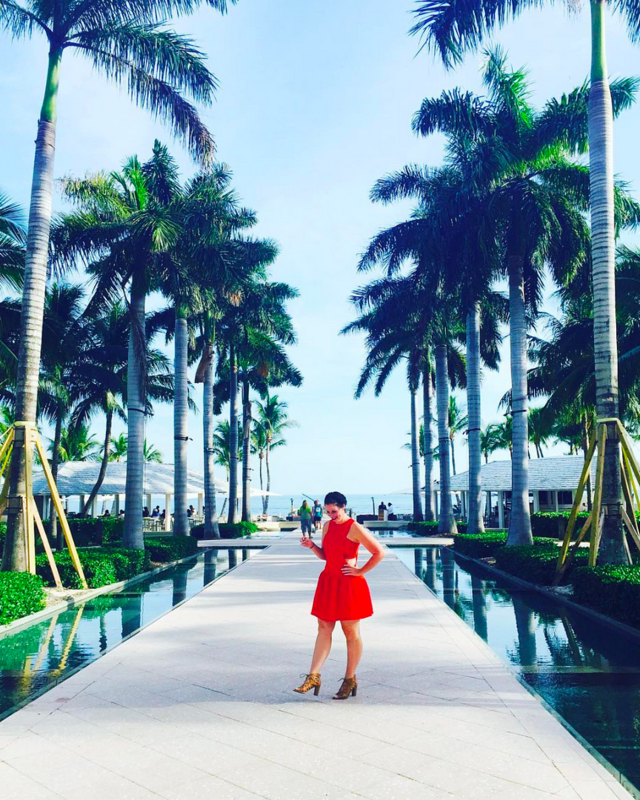 I did a weekend staycation last summer and it was awesome. I love bulking up long weekends. Enjoy your week! Oh you guys should also check out Chicken Scratch in Oak Cliff! Mashed potatoes on your fried chicken sandwich?! HOLY YUM. It's really not fair that you can't take an actual vacation!!! But you know what they say. Nobody said life was fair. I basically live for vacation and I hoard vacation days and save like crazy so I can get it. Staycations can still be awesome though. At least you don't have to go to work. I have lived in Dallas the majority of my life and I haven't even been to some of these places! Looks like I need a staycation too! Ah, I was planning a little weekend trip to Dallas and could not, for the life of me, put together a list of things to do. This is perfect! So fun! My in-laws love in Fort Worth and I love visiting them! Can't wait to stalk your Insta! I totally need to Staycation in my own city! There is so much to do in DFW! I love this list.. You are making me want to come back and visit Dallas!!! There are lotsof baseball around there so I don't think it would be that hard to convince the hubs. How fantastic! I need to do this in my city sometime.